Our 5th and final webinar of the Creating the Successful Law Firm Intranet will be presented on Wednesday, September 24th at Noon – 1:00pm Central Time. It follows the previous webinars in the series – Research, Design, Develop, and Rollout and completes the model we use when working with intranets. þ Three key metrics to track to communicate your success. þ How to plan for changes to your intranet. þ Creating a user advisory board for future input. Nina Platt, Principal Consultant, Nina Platt Consulting, Inc. Owner and principal consultant, Nina Platt, is a former law librarian and AmLaw 100 firm library director who has worked with knowledge management (KM) in law firms since 1986. She has written and delivered numerous articles, presentations and papers on both KM and intranet-related subjects. Laurie is a Certified Usability Analyst and a Certified Business Analyst providing clients exceptional results with intranet planning and design since 1994. Her company specializes in User-Centered Design, Marketing, Communications and Training. Amy Witt, Project Analyst, Nina Platt Consulting, Inc.
Amy has over 8 years of experience planning and managing intranet projects and teams. Previous to joining NPCI, Amy was Intranet Manager in an AmLaw 100 firm. Elizabeth is responsible for the firm’s knowledge management infrastructure and research systems, ensuring that the firm’s collective experience and expertise are captured and applied for the benefit of the firm’s clients. As part of her role, Elizabeth manages the firm’s extensive precedent collections. She is responsible for the continuing development of technology and internal processes that support the firm’s lawyers in their advice and direction to clients. If you have participated in the previous webinars and have yet to register for Webinar 5: Measure and Maintain, register for this webinar. If you haven’t participated in the previous webinar, you will have the opportunity during registration to purchase the recordings of the previous sessions. Categories: Intranets, Training | Tags: intranet, intranet model, intranet planning, intranet strategy, Intranet webinar | Permalink. You want to redesign your intranet or portal? Success in such an initiative is fleeting at best if you approach it without a strategy. Doing the work up front outlines why you want to engage in such a project, what content or resources you will provide via your site, when you plan to do the work, and who gets to take on the task. To create such a strategy, you will need to ask yourself a few questions. Move to new or improved technology platform. As new development tools are released to the market, new standards for development evolve. A redesign may be needed to keep up. Improve content management. Your firm may be one of the many who still maintain sites with static html pages or you may have the need to direct all new additions or changes of content be done by a select individual or individuals, creating a bottleneck in updating the system. Distributing management of content to those who are subject experts or who own the content could improve the situation. Reduce development time. Firms with Intranets that are well used generally have a backlog of pages and/or applications that need to be created. New tools for creating web pages or sites can reduce the time spent by developers and may even allow the staff who manage content to develop simple pages/sites. Improve usability/navigation. Each user may have different needs when it comes to using an intranet. Using employee roles or workflow are just a couple ways to make usability and navigation better. Examining how work is done in your organization could be the key to improved usability. Other factors like improved search or site structure improve usability and navigation as well. Improve support of intended purpose. Perhaps your goal is to use the intranet as a communication tool, computer desktop, knowledge management platform, or other purpose. You may need functionality you don’t have in your current implementation. What are you going to make available on your internal site? The answer to this will help you determine platform and tools needed for implementation. Content can be vastly different depending on organization and purpose. Will you use the site for communication, knowledge management or various other functions? Do you have web applications that will be linked to the site? What will your structure look like? Will it be developed according to how the firm is organized or will you be using another organizational structure? Will you focus on building a client/matter centric site? When will you be implementing each part of the site? Part of the strategy should include how you plan to maintain the site. Are there components that need to be done in phases? Once they are complete, will you be following a calendar for changes and updates? Who will create and maintain the site? You will also need someone to develop the content management and communication plans. This isn’t an exhaustive list of tasks but it is a good start. Will it be done in-house or outsourced? 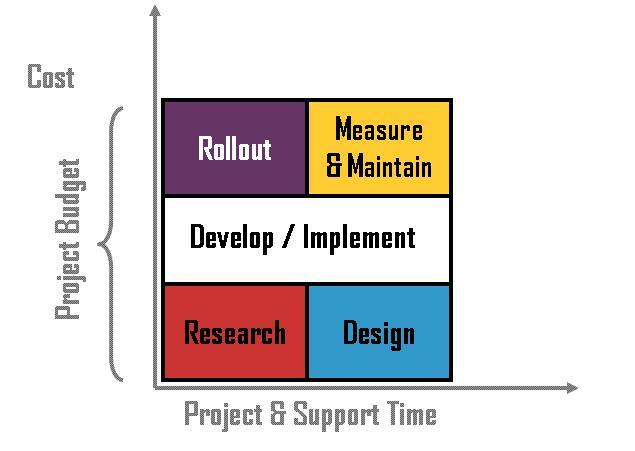 Do you need to outsource parts of the project like the initial planning? Does your staff include people who can provide project planning including strategy, timelines, and more? Do you have someone who will be able to address usability, gather user requirements, develop the user and technical requirement documents, develop the site and do project management? How will you create and maintain the site? The platform used for the site will drive how the site is developed. However, unless there is a good reason, you should wait to determine platform after developing user requirements. SharePoint, Plumtree and other intranet/portal products are similar in many ways but also have distinct differences. Building a custom site will give you exactly what you want, but at what cost? At the same time the portal products require development time as well. There are many good reasons for wanting to redesign or develop a new portal/intranet and many ways to go about doing so. The key is to have planned your strategy before starting to make sure the initiative is successful. Categories: Intranets, Strategic Planning | Tags: intranet strategy, Intranets, portals | Permalink.